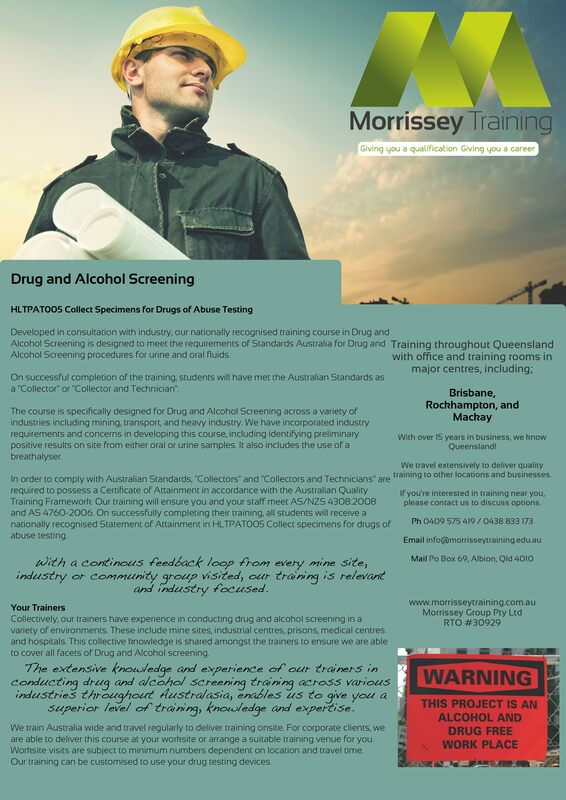 Developed in consultation with industry, our nationally accredited Course in Drug and Alcohol Screening is designed to meet the requirements of Standards Australia for Drug and Alcohol screening procedures in the workplace. Training specifically complies with and incorporates the requirements of AS/NZS4308:2008 and AS4760-2006. Our course in drug and alcohol screening can be customised to meet your specific site requirements and includes the use of a breathalyser. On successful completion of the training, students will have met the Australian Standards as a “Collector” or “Collector and Technician”. Collectively, our trainers have experience in conducting drug and alcohol screening in a variety of environments. These include mine sites, industrial centres, prisons, medical centres, and hospitals. This collective knowledge is shared amongst the trainers to ensure we are able to cover all facets of drug and alcohol screening. We travel extensively through Austalia delivering this course, if you have multiple students requiring training, contact us for a customised onsite quote. This comprehensive one day course is also delivered frequently from our training rooms in Mackay, Rockhampton, and Brisbane. View our course calendar for upcoming course dates in your region.